Are your skills and knowledge more valuable than they were six months ago? Nothing is static: legislation, technology, products, competitors. It is easy to become obsolete. If you were an expert two years ago but stopped learning, the odds are you are no longer an expert (ok, if your expertise is renaissance paintings you may be an exception). Workforces are distributed, there are less water cooler moments. Formal training only accounts for perhaps 5% of what workers need. Learning is increasingly a personal task as we all need to learn continuously. For organisations the key question is “Are the skills and knowledge of our workforce more valuable today than they were a month ago?” The half life of a business skill has dropped from 30 years in 1984 to 5 years in 2014. If you do nothing to stay smart, you are becoming obsolete by definition. These are challenging times. Learning is not what it was. It requires discovery, filtering, sensing and discussion. It is social and continuous. However, the positive news is we have never had more powerful tools than we have today to stay on top of what is happening and to keep learning, even if your team is remote and spread across the world. In this new world we need models of learning that equip us to thrive in this environment. Harold Jarche has outlined a model of Personal Knowledge Mastery which we have found useful at Anders Pink. Whilst he refers to it as a personal model, it is also a social learning model, as it works for teams as well as individuals. Harold’s model has three distinct stages, seek sense and share. This is our interpretation of what it means in practical terms for professional teams. Things change and stuff happens. It’s hard to stay on top of it all – even if you have the will, you probably don’t have the time. We need filters to help manage what we see. The most obvious first step to stay knowledgeable is to get a daily briefing. The best example is probably the daily briefing that is prepared for the President of the US. In essence things change and we need to stay updated. Most change takes place outside your organisation. If your team is not staying abreast of external changes and new developments, will their skills and knowledge remain valuable or will they decline? Use the Anders Pink app to get a custom daily briefing for your team. You can filter by keywords, domains, what is shared by influencers and bring in RSS feeds. Learn how to set up team smart team briefings in AP. Use tools such as RSS readers to track content a site is publishing but the reality is that sites are reducing their use of RSS feeds and the feeds themselves can be a blunt instrument as you’re only seeing what the RSS editor wants you to see. Review industry websites and groups that cover your areas. But there are many of those, and they vary in quality. Do a regular BuzzSumo search to see what was the most shared content in your industry in the last day or week. Follow experts in your field and see what they share or publish, for example following a large number of experts in Twitter or subscribing to blogs and newsletter. Harold Jarche argues that there is no tool or platform to achieve the seeking and filtering required other than the internet. It is a complex and difficult task but one which we have been exploring. Filters need to be a combination of human and machine filters. Algorithms can help to sift by relevance, recency, and most shared. But no single algorithm is enough, even one as powerful as Google’s. You also need humans – your team and experts you trust – to further refine, add value and validate content. Think of it as a team of advisors who know your specific interests and help to draw your attention to the most relevant information – and block what’s not relevant for you. This way you can get a head start and be aware of an article published this morning before other experts. The app is in beta but we are happy to give you access. Just request access here. Harold talks of the need to validate, synthesise, present and customise information as key elements of sense-making. 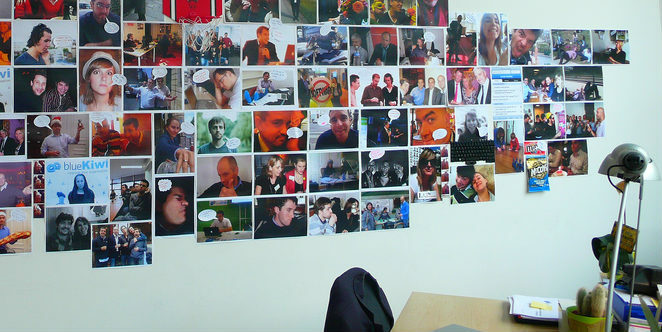 Commenting on content is a way of doing this, as it helps you contextualise information for you and your team. You also add value for colleagues when you relate an article to a project or challenge you’re working on. Even the most sophisticated machine learning and deep learning will struggle to do this as well as a person. This is where you need human filters to add value beyond machine learning. An individual will know what is happening inside their organisation and the applicability or relevance of new developments. They can synthesise this information and present it in form they can discuss with their colleagues. Sharing is what drives value. It is not enough to read and reflect personally but to contribute to our teams and networks by sharing. You build trust by showing that you’re discerning in what you share – as Charles Leadbeater put it, you are what you share. Sharing needs to be simple and structured. This can take a number of forms. At the simplest you can like, share or tag content to highlight it to others, but ideally you want to go further and add value. You can rate the information which provides more value, you can comment on why you rate the information, you can flag it for the attention of your team and discussion. We would add a second stage of sensing, which is group reflection and discussion. It is difficult to make sense of the world by ourselves. Thus there needs to be a feedback loop back following interaction and sharing. We need a team to help filter, share and discuss to create understanding. Whilst learning is increasingly a personal task, collective intelligence is what helps teams outperform others. Personal resource libraries are not as powerful as resources accessible by your team or the wider public. A shared collection of relevant information and articles is far more powerful than personal libraries. 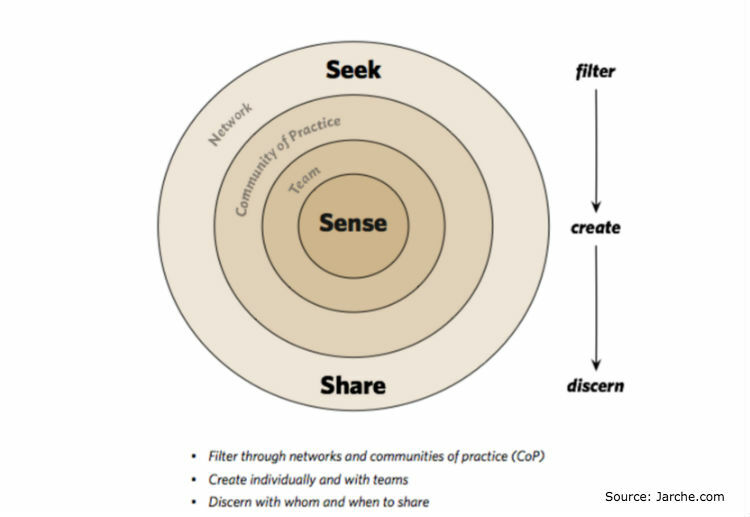 Our Anders Pink App has been designed to support continuous learning based on this Seek, Sense, Share model. We aim to help you stay smart and relevant every day. Give it a try, sign up today, its free. You can also join our Startup community to see an example of a team dashboard and how sharing adds value to a team’s collective knowledge.